We kick off with these weird, giant, alien-looking, tentacle, wolf creatures trying to track Clay ( Weapon H). But Roxxon isn’t the only one tracking down Clay. Turns out, his wife is looking for him now too. She started asking questions about his death only to find out that his death may have been a bit far-fetched. This part was actually interesting because we finally got some background on what “may” have gone down. In this issue, we find out that Clay was ex-military (assumed) but that his squad was going to kill civilians and turned out Clay killed his own team instead. 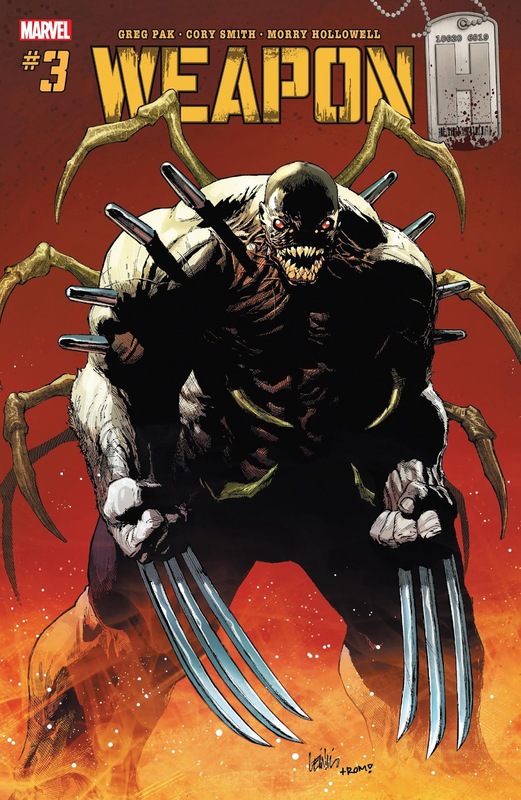 Now, why would he do that unless he was being tested on prior to becoming Weapon H?!? .... that’s my opinion personally. Anyway, they told his family he was killed in action. But Clay’s wife tracked down an old war buddy to find out that he feels there is no way Clay was killed. The people that lived where he was stationed were basically Gandhi loving granola hippies. So, his wife becomes even more interested in finding out what happened and leaves her kids with her mother for a couple days to go searching for more answers. Meanwhile, Clay first “Wolverines out” and takes down some of the Wolf creatures, which was cool to see that he can half change and not totally “Hulk out” as well. He kills a couple of the creatures to save some hikers but when more come at him, he goes full Hulkverine! He takes out at least 3 more and literally one-punches the Sky Whale blimp ship ..thingy... that was following him and destroys it. Then, about 6 flying tentacle sharks come at him and start biting him. Clay physically cuts part of his own leg to get free of one of the creatures, which was nuts and continues on like nothing happened. Meanwhile, this continues to be a set up from this scientist guy who appears to be the one who may have made him AND is testing him for something big. We find out that Clay was not only combat trained but also in the art of many fighting styles. Basically, he’s literally a Hulk and a Wolverine combined. The strength, speed, durability, quickness, fighting prowess, and mental intellect of them both combined. Heck, he can even change his scent to stop from being tracked. Honestly, he should be feared. But Roxxon and this scientist guy need to find him soon because something back at their lab is glowing red behind some locked door ready to explode and it appears the Hulkverine is the only one strong enough to stop it. My thoughts: this book is getting good. It’s not too convoluted but you are left each issue wondering something new, as well as more questions about what’s going on. For example, Hulkverine has red glowing eyes just like the scientist. And the locked door also has glowing red stuff coming from it. I feel like we are meant too see all of this because they are all going to be connected deeper than just “ the scientist made him”. But how? Did the scientist also perform the same experiment on himself and his using Clay to test his own abilities? Will the scientist become Hulkverine’s Sabretoothed-Abomination? Also, who is Roxxon and what the heck are they doing? We have alien creatures mixed with animals all over the place. Are they just mad scientists or do they have an actual plan? Maybe they’re using these creatures for war? And why would Clay, who was obviously a trained killer for the military, like Jason Bourne, just magically turn on his squad? This book is great. 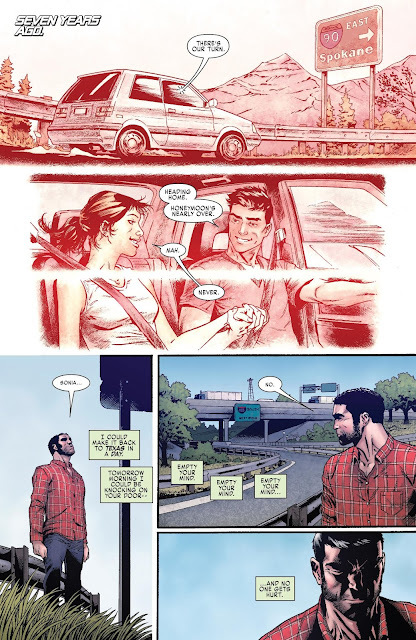 This issue is great. It’s a fun read.... just don’t show up expecting some deep and thoughtful masterpiece. 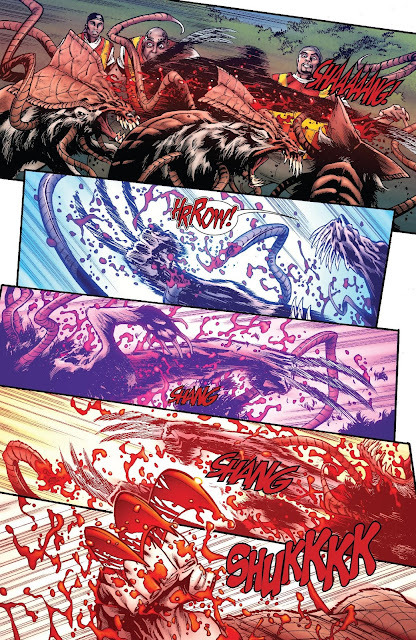 This is straight up action, fighting, blood, alien creatures, destruction, and excitement. If you want a book to have fun with, this is it. And, next issue looks like Hulkverine vs Man-Thing! 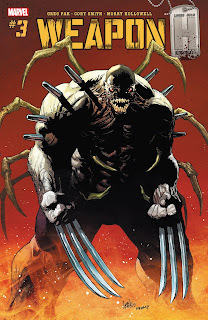 Weapon H is just fun. Greg Pak does a great job gradually sprinkling in knowledge and background info each issue on Clay, the Roxxon Corp, and other juicy tidbits that are helpful along the way but still gives the reader something fun to read. Pick this book up and move it towards the top of your pull. You‘ll be happy you did!